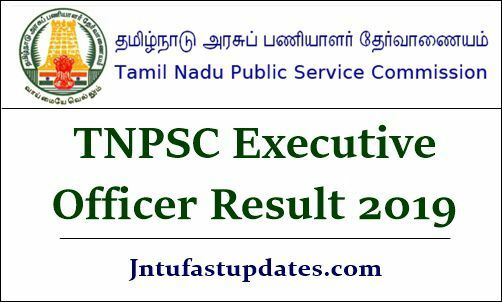 TNPSC Executive Officer Results 2019: Tamil Nadu Public Service Commission (TNPSC) recently conducted the written test for executive officer posts. TNPSC conducted the executive officer grade 3 examination on 16th February and executive officer grade 4 examination on 17th February 2019. The examination has been held in a large number of examination centers across Tamil Nadu. As this is Tamil Nadu state government job, a large number of candidates have competed for the written test round. All the competitors who have come across the TNPSC Executive Officer Grade III and Grade IV examination can check the question paper solutions for 16th and 17th February examinations from the official portal, tnpsc.gov.in. The answer key usually releases within 3 to 4 days after the examination. Hence the competitors can download the answer keys and evaluate the score before checking the result. This will give an idea about the attempt and the score that is going to be obtained in the test. Candidates appeared for the TNPSC Executive officer examination will have to wait for a few more days to check the result. The organization will shortly come up with the announcement of result date. The result is expected to release shortly on TNPSC website. Hence the hopefuls can stay visiting the TNPSC website on a frequent basis to check the update regarding the result, cutoff marks, and merit list. Tamil Nadu Public Service Commission (TNPSC) has recently issued a recruitment notification for 120 Executive Officer Grade III & IV Posts (Grade III- 55 Posts & Grade IV- 65 Posts). Many of the aspirants seeking to get Tamil Nadu state government jobs have applied for the executive officer posts. The organization received a large number of applications from the interested and eligible aspirants this year. To select the suitable aspirants into executive officer posts, the TNPSC will organize the written test and interview rounds. Whoever qualifies these rounds with good merit will be considered to appoint in the announced posts. Hence the competitors must get the good merit in selection rounds to get the Tamil Nadu state government jobs. Candidates competed for TNPSC Executive officer grade III and Grade IV examination can expect the result in the month of March [tentatively]. As per the information from sources, the result is anticipated to release within 3 to 4 weeks after the examination. Hence the hopefuls can stay patient until the result date is announced. TNPSC website will leave the time to time updates regarding the result date. As mentioned earlier, merit candidates will be given the top priority in selection. Hopefuls scoring the qualifying marks/cutoff marks in the exam will be mentioned in the merit list. For candidates mentioned in the merit list, the organization will conduct the interview round. The cutoff marks/qualifying marks will be announced along with results. TNPSC Executive Officer Gr III and Gr IV Category-wise cutoff mark 2019 will be unveiled. Hopefuls have to score more than the announced cutoff marks to clear the written test round and to get shortlist for the interview round. Candidates competed for TNPSC posts can visit the official website, tnpsc.gov.in to check the result, cutoff marks, and merit list. Hopefuls need to visit TNPSC website, tnpsc.gov.in at the first step. On the homepage, ‘Executive Officer Grade III and Grade IV result 2019’ link will appear. Click on the link and enter the required details such as register id, password etc. tnpsc Gr8-grade 4 cutt off details?